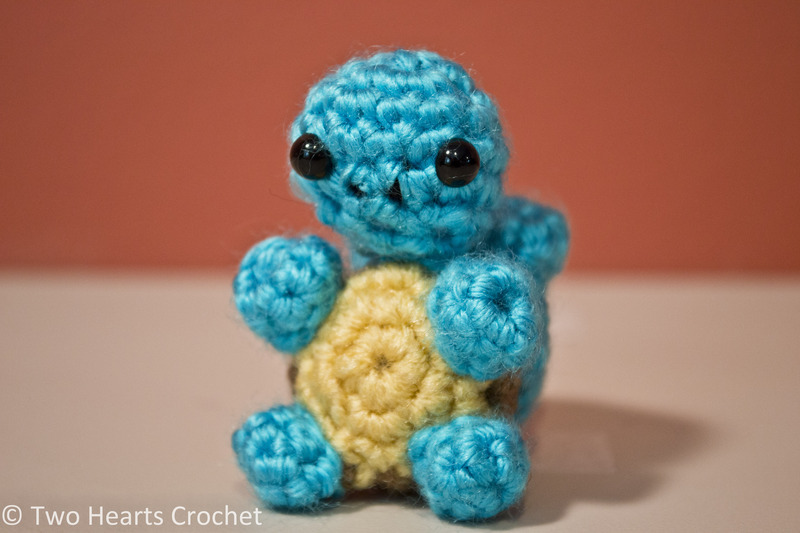 Next in the Mini Pokemon series is perhaps my all-time favorite Pokemon: Squirtle! 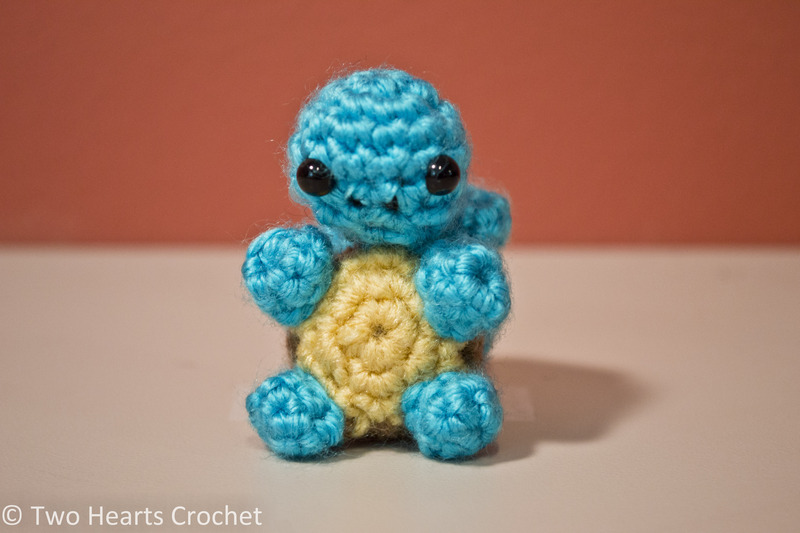 It’s so cute and cuddly–plus, it’s a turtle! Designer note: With careful adjustment of eye placement, you could easily make a bunch of little turtles with this pattern! Rnd 1: In creamy yellow, make a magic circle. Ch 1 and work 6 sc in the center of the circle. Join to the beginning of the round and ch 1. Rnd 2: Work 2 sc in each st around. Change to aqua, join and ch 1. Rnd 3: In aqua, *2 sc in first st, 1 sc in next st* – repeat around. Join and ch 1. Rnd 4: Work 1 sc in each st around. Join and ch 1. Rnd 5: *sc2tog, sc in next st* – repeat around. Join and ch 1. Rnd 6: *sc2tog* – repeat around. Join and ch 1. Rnd 7: *sc2tog* – repeat around. Join and fasten off, leaving a long tail. Use the tail end of the yarn and your yarn needle to sew closed the remaining hole. Weave in ends. Rnd 1: In aqua, make a magic circle. Ch 1 and work 6 sc in the center of the circle. Join to the beginning of the round and ch 1. Rnd 3: *2 sc in first st, 1 sc in each of the next 3 sts* – repeat around. Join and ch 1. Rnd 5: *sc2tog, 1 sc in each of the next 3 sts* – repeat around. Join and ch 1. Insert your safety eyes into round 4, spacing them so they are a few stitches apart. See photo for details if necessary. Rnd 2: Work 1 sc in each st around. Join and fasten off, leaving a long tail. Rnd 1: In aqua, make a magic circle. Ch 1 and work 6 sc in the center of the circle. Join to beginning and ch 1. Rnds 2-5: Work 1 sc in each st around. Join and ch 1. Rnd 6: sc2tog, then sc in each of the remaining 4 sts. Join and ch 1. Rnds 7-9: Work 1 sc in each st around. Join and ch 1. Rnd 10: sc2tog, then sc in each of the remaining 2 sts. Join and ch 1. Rnd 11:Work 1 sc in each st around. Join and ch 1. Rnd 12: sc2tog, then sc in the last remaining st. Join and ch 1. Rnd 13: Work 1 sc in each st around. Join and ch 1. Rnd 14: sc2tog. Join and fasten off, leaving a long tail. Roll the wider end of the tail onto itself. Using the tail end of the yarn and your yarn needle, carefully sew the tail to the body, working a few careful stitches in the rolled part of the tail to help it keep its shape. See photos if necessary. Weave in ends. Take a piece (about 6”) of black 4-ply yarn and carefully split in half. The result is two strands of 2-ply yarn. Use a sewing needle to carefully make stitches for the nostrils. See photos if necessary. Weave in ends. And there you have it! 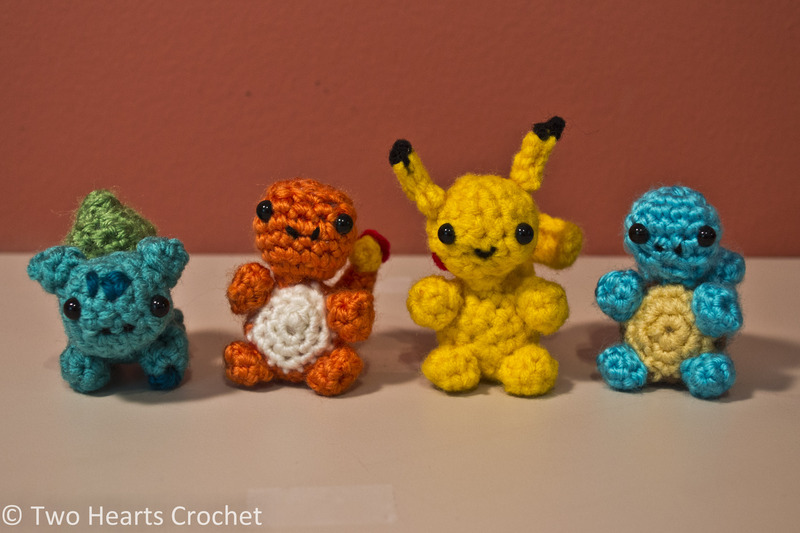 One miniature Squirtle, perfect for your collection! I love his little curly tail! 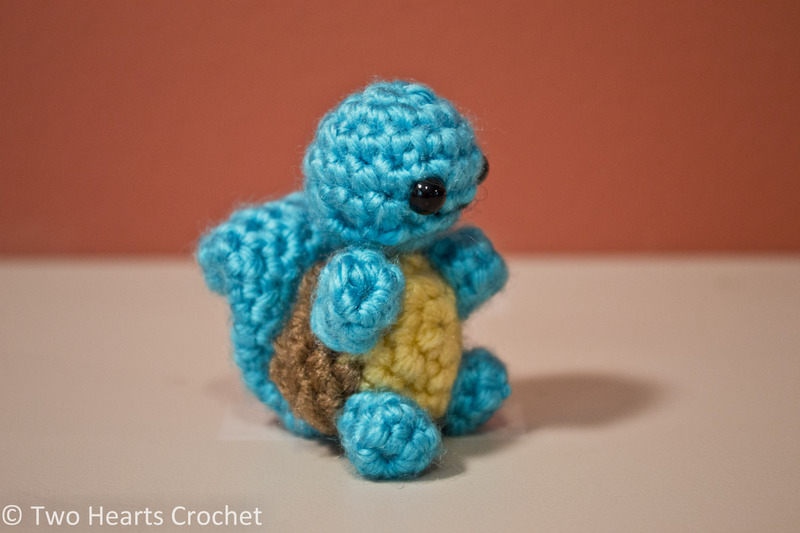 In the ‘body’ section you say change to aqua – wouldn’t it be change to the turtle shell brown?